Price Points allow you to to have products grouped based on pricing. This is useful if you are going to use the EasyCart sidebar widget that displays all the price points and users can then select which range of products they would like to see. To establish price points, simply choose to add or edit an existing price point. you will notice it can be designated as the bottom value, a middle value, or a top end value. 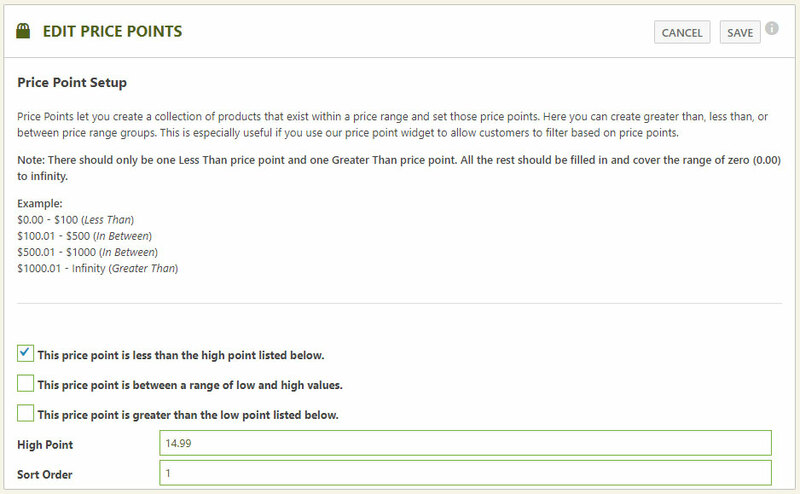 Think of price points as groups or ranges that products filter by. 1 must be the ‘Less Than’, 1 must be in between, and 1 must be Greater than. You may create as many in between groups as you like.